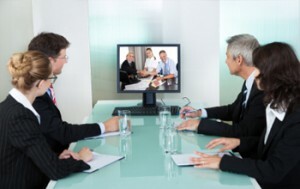 DoIT offers TelePresence videoconferencing for departments who need to connect with colleagues across the country. Choose the facility best suited to your needs, invite your colleagues, and let the meeting begin! Save travel time and money through videoconferencing. Our videoconferencing service lets you connect with colleagues so everyone can see and speak to each other for real-time discussions. NOTE: TelePresence facilities cannot be scheduled for course delivery. Check room availability in your calendar invitation just like any other attendee or resource. Each facility is listed under “TelePresence” in the Global Address List. The Ellis Library TelePresence site is permanently locked and requires card access. The meeting organizer may pick up the card at either the north or west main entrances (if you are not the meeting organizer, you will need to know the organizer’s name and show your ID card before checking out the TelePresence access card.) Return the card to the same desk when your meeting is over. If your conference will begin or end outside of library hours, contact Ellis Library Security at 573.882.4220 at least five business days in advance to make arrangements for the library to open. Refer to the Touch Screen User intro or the Touch Screen basic instructions for detailed instructions. Hard copies of the guides are available for the Ellis Library TelePresence site. If you want on-site technical assistance during your conference, contact DoIT Videoconferencing at least five days in advance. Videoconferencing service is available at no charge to MU departments during normal business hours. Requests outside these hours incur a fee of $90 per hour (one-hour minimum) for the on-call technician. Audio conferencing charges will apply if you are connecting non-videoconference users. Videoconferencing Service is available MU departments at no charge during normal business hours (Monday-Friday, 8 a.m. - 5 p.m.). Reserve the TelePresence conference as part of a meeting invite (you must include two TelePresence sites to establish a meeting). Each facility is listed under “TelePresence” in the Global Address List. You will be able to check room availability in your calendar invitation just like any other attendee or resource. If you need to schedule a TelePresence conference with a room outside the University of Missouri system, follow the instructions on the MOREnet TelePresence scheduling page.